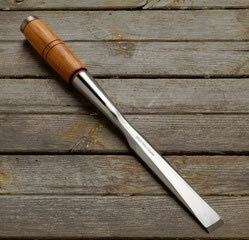 Shaped along the lines of traditional, century old designs, we have created a new tool. 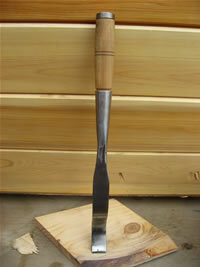 It feels very balanced in the hand and is delivered with the edge sharpened and polished. 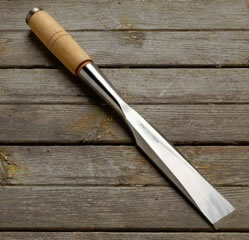 We all start out with machine-made chisels, and then find out quickly that the edge gives way within a very short time. How pleasant then to discover that our Traditional Framing Chisels will go on for hours before you need to touch up the edge with a hone. 15 seconds with our Belgian Blue (Garnet) honing stone and you are good to go again. Our chisels will take and hold a superior edge that will last longer, bar none. Forged from modern carbon steel, tapered toward the socket, with a flat back, slight beveled edge and an ergonomically shaped socket handle, they are a must for mortise and tenon work. All our framing chisels follow the design features of turn-of-the-century tools, in their shape and unique socketed handle. But whereas those old tools, until the advent of "silver steel", were most often of heavy, forge-laminated steel, our blacksmiths use modern carbon steel. This allows them to create a sleeker, somewhat lighter, yet tougher tool. All our tools are a delight to hold and work with. Our handles are turned from well seasoned, dry hard wood: American hickory from Tennessee, or on request ash, oak, and custom or exotic made to order: cherry, purple heart etc. They offer a larger, palm-of-your-hand sized grip and are treated with all-natural LAND ARK wood finish. Choose from a short or long handle. You will notice the special attention placed on the correct placement of all ferrules, the tapered fit and folded over and hammered end grain, precisely fitted to withstand blows with a mallet. Tip guards and holsters — Protect your investment with a high-quality, handcrafted leather guard made of saddle-grade leather which is stitched and riveted. Tip guards available for framing and bench chisels, choose also one with a tie-string or a belt holster. Tip guards for slicks and chisels come with ABS plastic backing inserts. 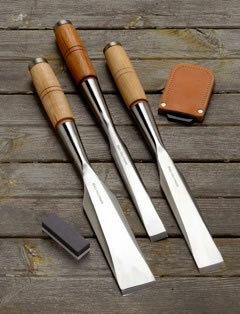 For sharpening tips look at our Belgian Stones. 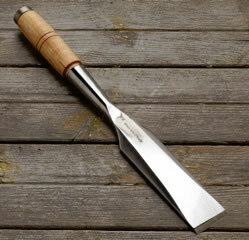 Traditional Framing chisel 1 1/2"